Right from the outset German Stegmaier is displayed the qualities of a true draughtsman. 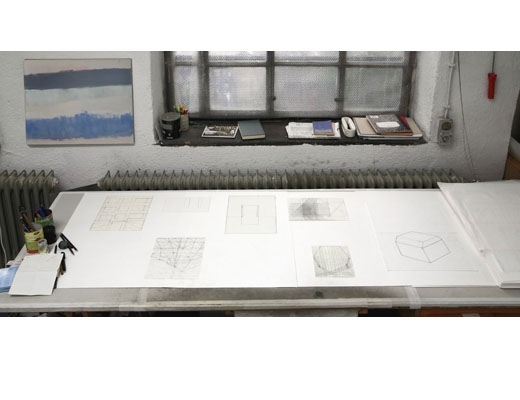 This observation is not prompted by the sheer number of his works on paper - although this, rather than painting or sculpture, is indeed the medium in which he has been most prolific - but by a specific language of cautious exploration and unrestrained immersion in a process of perception and transformation, which makes his drawings quite unique. German Stegmaier (born 1959) lives and works in Munich. His drawings will be part of the upcoming shows LINIE-LINEA-LINE at Kunstmuseum Bonn (D) and MODERN TIMES at Kettles Yard, Cambridge (GB) and De La Warr Pavilion, Bexhill, Sussex (GB).